In celebration of National Bike to School Day, on May 9, a small group gathered near the Prado Entrance in northwest Coral Gables and rode their bicycles through the residential streets and a piece of the future Gables Greenways to George Washington Carver Elementary School and International Children's School. If your family rides their bikes to school regularly or ocasssionally, please share your story with us as we reach out to our elected officials at the City of Coral Gables to build safer streets for children to ride: bikewalkcoralgables@gmail.com. The City of Coral Gables has been working the past few years to create safe, accessible bike infrastructure for commuters and people of all ages and abilities. In 2014, the City Commission adopted a publicly-vetted bicycle and pedestrian plan. For the past few months, the City has been working with the community to implement the central spine of a low traffic-stress bicycle network. The “Gables Greenways,” are planned to connect downtown Coral Gables north to 8th Street, and south to the Underline, the University of Miami, and the Old Cutler Trail. A temporary demonstration of what the Gables Greenways could look like through our downtown is now in place on Salzedo Street and University Drive. The project is an important step forward, but is already being scrutinized by some groups for changing how we allocate road space. Unfortunately, there is a real danger that these new bikeways will never be implemented if their detractors shout louder than their supporters. 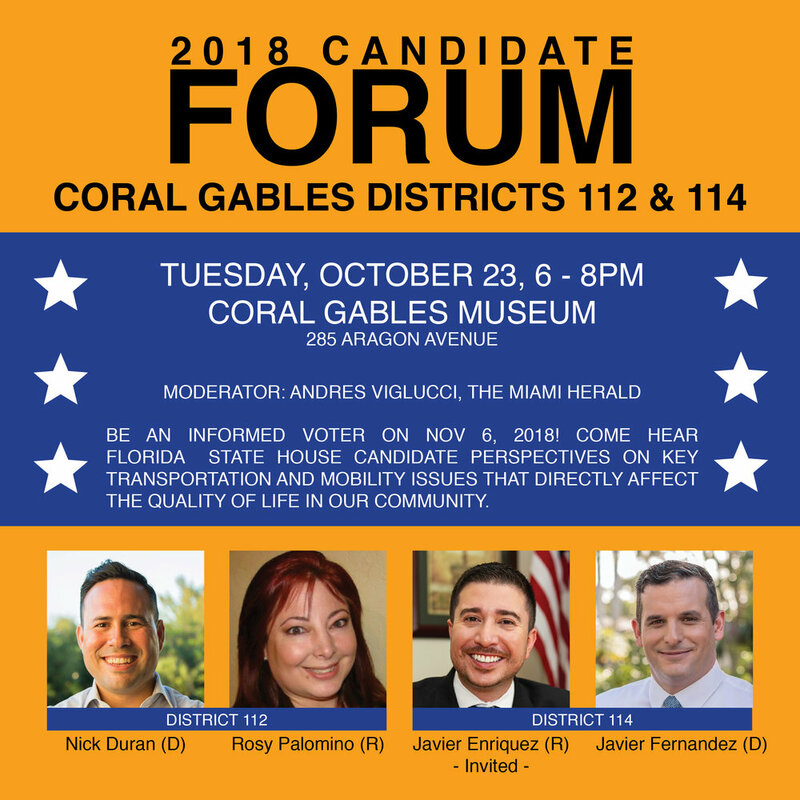 Now is the time for businesses leaders in Coral Gables to speak up for safer streets and world-class transportation options. We are encouraging supporting businesses to join us in asking our elected officials to not delay the implementation of this important upgrade to downtown mobility and quality of life. 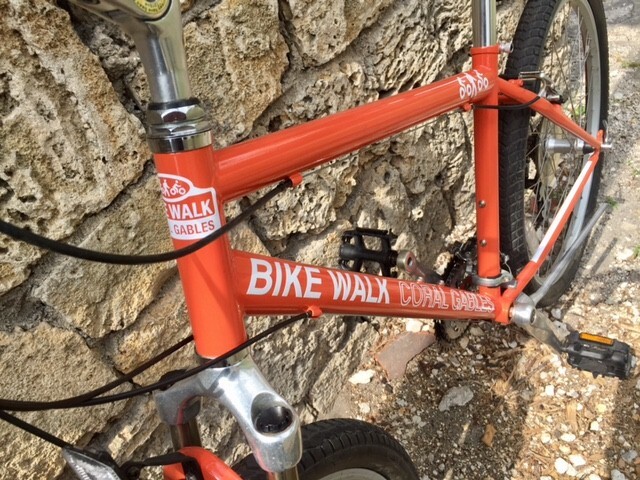 Email us at bikewalkcoralgables@gmail.com so we can add your business name and logo to our growing list of supporters. Email a letter to the City Commission to let them know your company supports the Gables Greenways. Feel free to start from one of our sample templates for Standard, Retail, or Healthcare. If you are an employee: talk to someone empowered to speak for your organization about supporting the Gables Greenways. Or use our template. Help us recruit more businesses using this flyer. Why should Gables businesses support this? Employees deserve to have safe, affordable, and attractive transportation options. The quality and availability of workplace bicycling can influence the career decisions of employees. Having a low-stress, high-quality bike network is one benefit that can help attract talented workers and retain valuable employees. In recent years, major world cities like New York, Copenhagen, and Paris have used bike facilities to improve their citizens’ lives. Cities across the country are rapidly working to catch up by building their own bikeway networks. If Coral Gables hopes to stay competitive in a changing global landscape it must make this a priority. We love this city. We want to be able to walk, eat, and laugh on its streets. Poor air quality and noise pollution affect businesses as well as residents. A shift from driving to bicycling also helps to combat climate change and sea-level rise by reducing greenhouse gas emissions related to personal transportation. Studies show that bicyclists and pedestrians spend more money in local retailers than motorists do. Increasing bicycling will help support the small businesses that help our city to thrive. People in Coral Gables work hard and are short of time. Fitting exercise into a daily commute makes for healthier, more productive teams. Thousands of trips are made by bike in Coral Gables every day; increasing this number will continue to reduce congestion on crowded streets, Metrorail trains, trolleys, and bus routes, especially at peak times. That means we can all get more done. What if I don’t represent a business? Any organization that employs people in Coral Gables will be affected to some degree by these plans, so it’s important that you speak up. Is your employer a school, non-profit, or healthcare provider? Have a senior member of the team write in. This is a vital issue for many of your colleagues. You can also write in as a resident, student, or community representative to share your support for the project. Thank you for your support for Bike Walk Coral Gables (BWCG) in 2017. Our community and supporters have been essential to our success this year and we’re proud of what we’ve achieved together. We started the year off by partnering with the Coral Gables Community Foundation to offer a bike option for participants of the annual "Tour of Kitchens." We'll be offering this option free again this coming year, February 3, 2018 - let us know you'll be joining us! We also rolled into March 'Bike Month' with the City of Coral Gables, Chamber of Commerce, and the Coral Gables Museum with the annual Bike to Work Day! We love encouraging residents and businesses to try biking to work for a day! Join us the first Friday of March 2018! On March 12th, we produced our 6th annual Gables Bike Day, with friends and neighbors in front of City Hall. Dozens of kids learned how to bike safely from our friends at BikeSafe, and Green Mobility Network offered free bike valet. We honored all of our generous sponsors and former Commissioner Ralph Cabrera. Join us for our next Gables Bike Day on March 25, 2018 and invite your friends! We also presented our programs and contributions at Miami-Dade County's Bike Friendly Summit, representing "encouragement" organizations and being a voice in our community. We shared are successes in our annual Gables Bike Days, monthly Gables Bike Tours and safety talks, our bike mentoring program, among others. Despite the rainy weather the morning of our annual Bike & BBQ event, we had a great time with friends, live music, and delicious BBQ provided by Whole Foods Market. Join us again this year on April 29. We were recognized with an award as a 'green' non-profit organization in our community at the annual Green Means Green awards ceremony, hosted by our friends from the Chamber of Commerce. We were honored to be recognized among other individuals and organizations in our community. Our friends at No Boundaries and Espirito Santo Graphics created our first mascot bike, Sunny, this year. We've enjoyed spotting Sunny around the community and joining most of our Gables Bike Tours. We had the honor of presenting our Galiano Green downtown Coral Gables park project to the Coral Gables Forum. We shared the importance of public spaces to encourage more people to get around on foot or by bike. For the first year, we participated in the national event, Miami Walks (nationally known as Jane's Walk) with the Coral Gables Museum. We hosted a free version of the Downtown Coral Gables walking tour. Join us again the first weekend in May 2018. We're also excited that the City has started to implement the 2014 Coral Gables Bike & Pedestrian Master Plan. 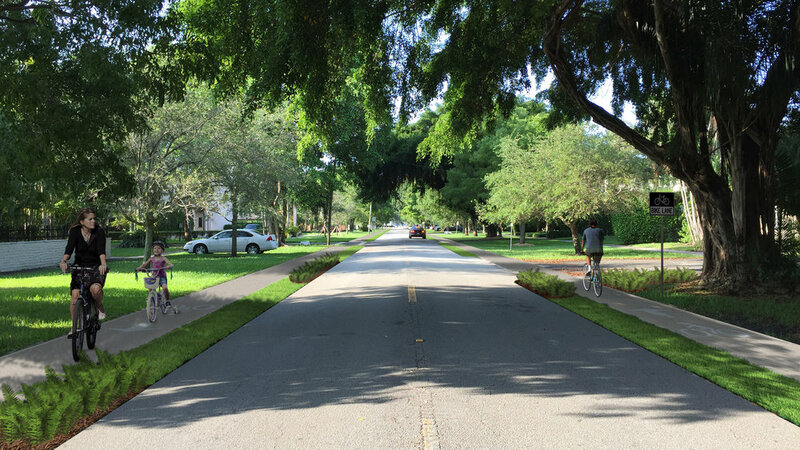 The Gables Greenways gathered detailed input in September and October, and currently has a separated bike lane pilot project on University Drive and on Salzedo. Be sure to to try out! The City is expected to finally break ground on the first phase toward the end of 2018 or beginning of 2019! Closing 2017 with almost 2,800 “likes” on our Bike Walk Coral Gables Facebook page, help us reach more people in our community by inviting your friends to “like” our page to stay up to date on local events and initiatives that promote safer streets in our community for people to bike and walk. Follow us also on Twitter and Instagram! We’re looking forward to making our neighborhoods better for biking and walking with all of you again in 2018. The sixth-annual Gables Bike Day returned for a fun-filled day of activities on Sunday, March 12th, in front of City Hall. Gables Bike Day offered safe streets for the community to bike, skate, and walk by closing them off to motorized vehicles. This signature event, produced by the community-based non-profit organization Bike Walk Coral Gables (BWCG), promotes biking and walking safety. Gables Bike Day started off with a kick-off program on stage in Merrick Park, with a welcome by Bike Walk Coral Gables Board Chair, Jennifer Garcia, who shared the organization’s plans to create a new public space in downtown Coral Gables called the “Galiano Green.” The organization has also launched a membership program for the community to become more active and engaged. Avid cyclist and Chief Clinical Officer and Chief Operating Office for University of Miami Health System, Dr. Thinh Tran, gave remarks on the importance of building community. Commissioner Vince Lago also welcomed the crowd on behalf of the City of Coral Gables. Free bike tours escorted people on bikes by experienced ride leaders to see nearby landmarks. A bike rodeo, bounce houses, climbing wall, and other activities comprised an active kid’s area, and food trucks provided a variety of lunch options. Sponsors were recognized with plaques on stage later in the day. Gables Bike Day 2017 was made possible by UHealth and The Lennar Foundation; City of Coral Gables; Suncycling; Baptist Health; Milam’s Market; NP International; Coral Gables Business Improvement District; Coral Gables Fraternal Order of Police (FOP); Catch of the Day; No Boundaries; Canon; Miami-Dade County; Mr. Green Dean’s Vegetable Farm; Don & Jeannett Slesnick; and Shake 108. Thank you for your support for Bike Walk Coral Gables (BWCG) in 2016. Our community and supporters have been essential to our success this year and we’re proud of what we’ve achieved together. We started the year with a Trek the Trail #GablesBikeTour to learn and explore the important work the Friends of the Ludlam Trail having been doing on the future Ludlam Trail. We also led a Bike Option for interested participants with our friends at the Coral Gables Community Foundation for their annual Tour of Kitchens. We’ll offer this Bike Option again for February 4, 2017 – sign up and join us! On February 28, we held our 5th annual Gables Bike Day with thousands of our closest friends and neighbors in front of City Hall. Dozens of kids learned how to bike safely from our friends at BikeSafe. Our hourly bike tours were filled to capacity as tour guides, including former Mayor Don Slesnick and former Commissioner Ralph Cabrera, shared the history of our City Beautiful at several landmarks. Join us for our next Gables Bike Day on March 12, 2017 and invite your friends! As part of Bike Month, we partnered with the City and hosted a Bike to Work Day to encourage Coral Gables residents and businesses to try commuting to work by bike for a day. We also helped our friends at The Underline for the inaugural Underline Cycling Club monthly ride. Later in March, we hosted our 4th annual Bike & BBQ with our partners at the Coral Gables Museum. Bring yourself, your friends, and your appetite next time on April 23, 2017! 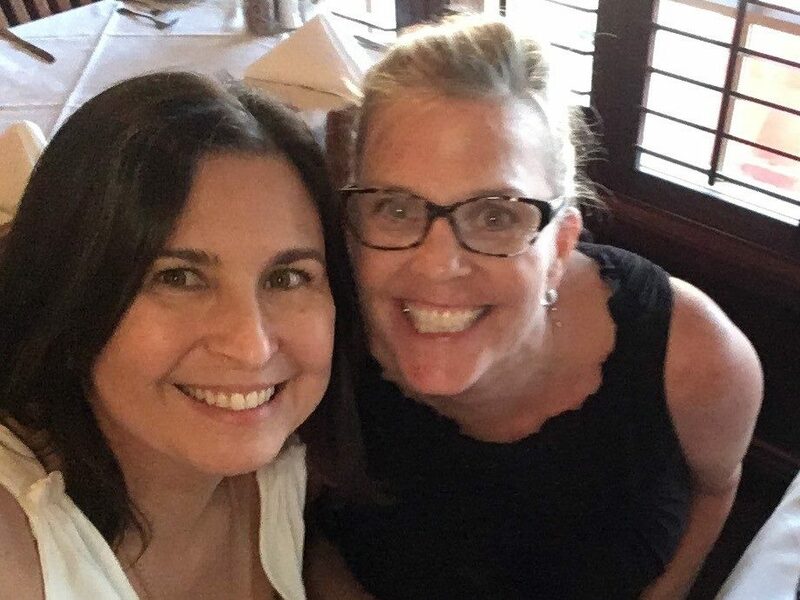 As part of our efforts to promote bike safety, we offered a bike ride leader training course with our friend Mary Beth Garcia from the Everglades Bicycle Club. We later applied these techniques at the inaugural Dade Heritage Trust Miami Bike Tours series, offered by our BWCG Board Member Christine Rupp. We officially thanked our Gables Bike Day 2016 sponsors with personalized plaques at our Sponsor Appreciation event on May 3rd. We also introduced our incoming Bike Walk Coral Gables Board officers and recognized our dedicated volunteer board members for all they do to make our community safe for biking and walking. Thanks to the generosity of our community and sponsors, we were able to donate downtown Coral Gables’ very first bike fixit station. We officially presented a check to the City Commission on July 26 and installed the station in August at the Museum Plaza. In September, Bike Walk Coral Gables was selected as a winner in the Miami Foundation’s Public Space Challenge and received a grant to create an urban park on the corner of Galiano and Almeria. 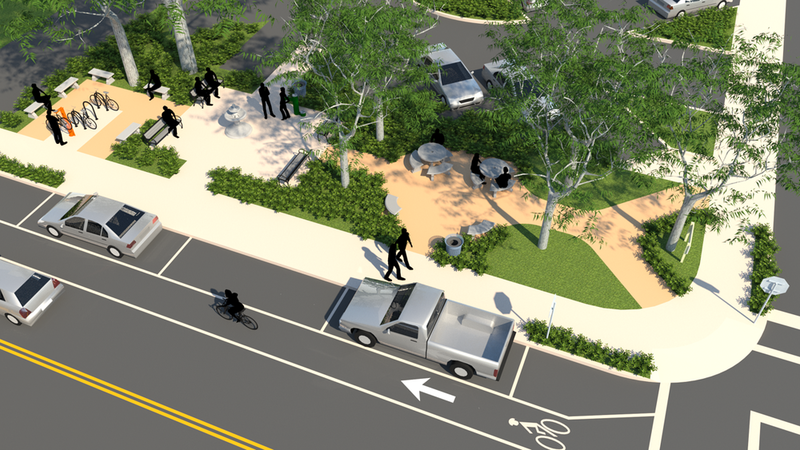 The “Galiano Green” Downtown Community Park will be a small green oasis in downtown Coral Gables and offer seating, shade, and bike amenities. The park is expected to open in spring of 2017. Our bike fixit station was officially unveiled on September 18, with Commissioner Vince Lago and City Manager Cathy Swanson attending and sharing the City’s appreciation of Bike Walk Coral Gables’ contributions to our community. We showed participants how to use the different tools available on the fixit station. In October, the Coral Gables TV interviewed BWCG board members about the new bike fixit station and general questions about biking comfortably and safely in Coral Gables. The film crew also joined a couple of our popular monthly bike tours. We participated in the Miami Foundation’s annual Give Miami Day event for the second time on November 17 and raised more than $2,000 – over 4x a much as last year. We’re looking forward to participating next year on Thursday, November 16, 2017. On December 9th, we presented the “Galiano Green” Downtown Community Park to the Coral Gables Parks & Recreation Advisory Board. The board unanimously approved the concept site plan and are looking forward to its expected opening in spring of 2017. We’re closing 2016 with a Facebook goal to reach 2,500 “likes” on our Bike Walk Coral Gables page – we’re only a few short. Help us reach this milestone by inviting your friends to “like” our page to stay updated on local events and initiatives that promote safer streets in our community for people to bike and walk. We’re looking forward to making our neighborhoods better for biking and walking with all of you again in 2017.